Open-source Jenkins is practically synonymous with DevOps-style continuous integration and test-driven development. CloudBees Jenkins Platform takes that foundational toolset and makes it enterprise-worthy. "This platform is our foundation for DevOps, being used by all of our teams," wrote one reader. "It allows our corporate tool support team to centralize management and operations of our Jenkins cluster," said another. 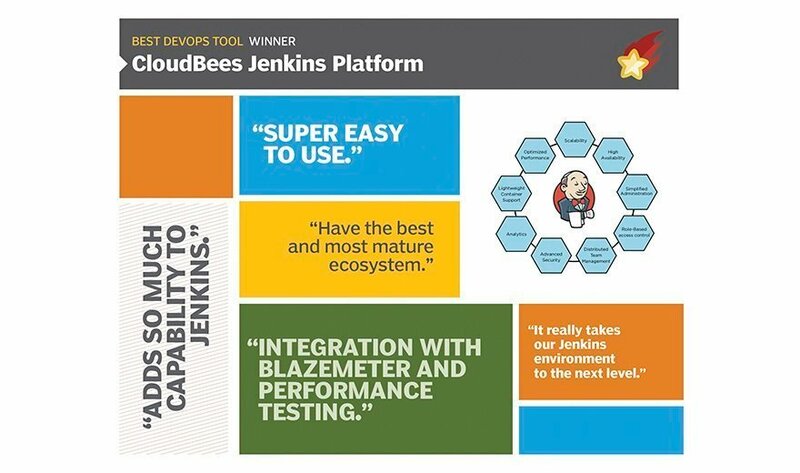 Features provided by CloudBees Jenkins Platform include role-based access control, high availability, distributed team management and analytics, plus integration with any number of platforms and tools: public and private clouds such as Amazon, Openstack, Kubernetes, or Microsoft Azure, or development tools such as BlazeMeter for load testing and New Relic for performance monitoring. Combined with Docker, CloudBees Jenkins Platform can replace older approaches to delivering applications. Choose Digital, of Miami uses Docker and CloudBees Jenkins Platform to automate the delivery of its white-label digital media marketplace that used to run on a Java platform-as-a-service. The real benefit that CloudBees Jenkins Platform brings to the table is its more than two dozen plugins, said Mario Cruz, Choose Digital CTO. "Getting started with open source Jenkins is pretty easy, but when you get out of dev and move into corporate production, that’s when you want to the enterprise support." What tools are in your DevOps chain? Interesting that this says they have the best and most mature ecosystem. We’ve recently started moving away from Cloudbees because they have stopped, or will soon stop, supporting many of the third-party plug-ins that we rely on in our pipelines.